Zendesk is a great platform for the fast creating your own CRM which can be used to save and process your customers’ feedback as a tickets. So if your company has a website which uses WordPress platform, and you’d like to convert all/one form(s) submissions into a Zendesk ticket, here is a solution we suggest. 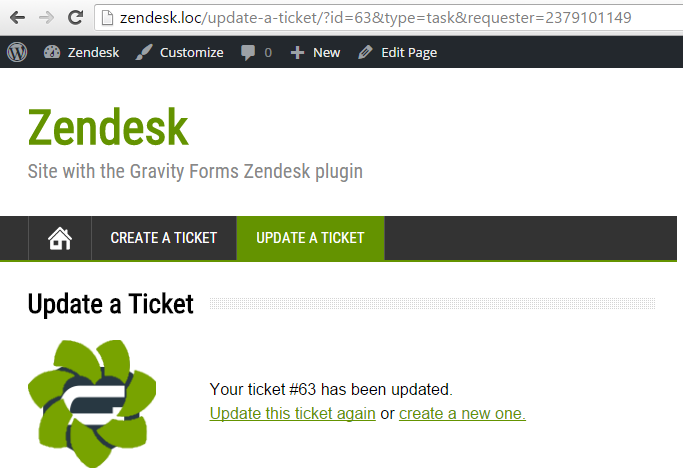 We are going to develop the plugin for creating and updating Zendesk tickets by users of some WordPress site using Zendesk API and Gravity Forms Plugin (further abbreviated as GF). We chose GF because it’s a de-facto standard for forms creation in WP world nowadays. In this article we’ll go through the all steps of creating, tuning and using the plugin which a plugin developer, a website admin and a user have to do. 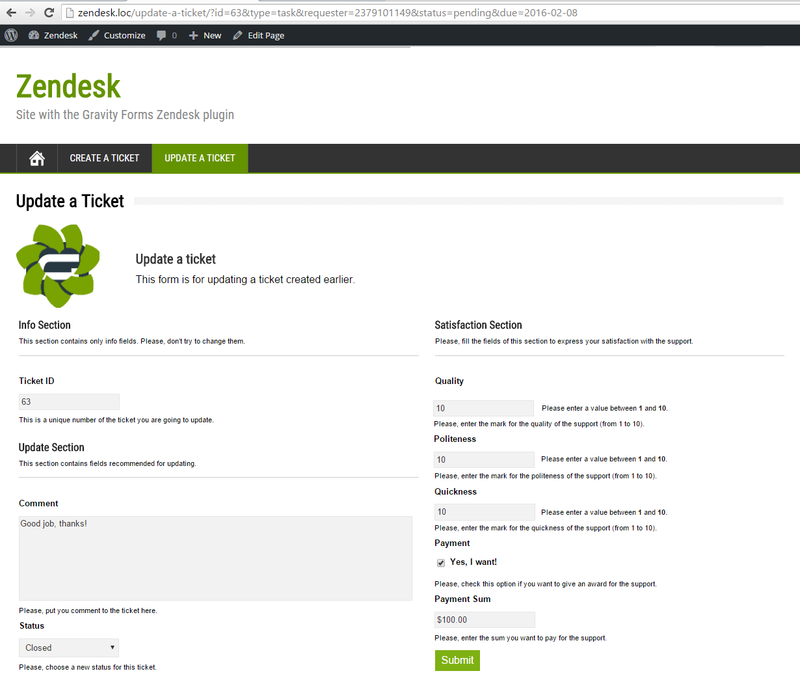 In the end we want to see a ticket with all system and some custom fields created on the WordPress side and located in the Zendesk CRM area. We have two main classes: Gravity_Forms_Zendesk_Admin – for defining admin-side functions, and Gravity_Forms_Zendesk_Public – for defining user-side functions. There is also the third main class Gravity_Forms_Zendesk where the Admin and Public classes’ methods will be called as callbacks for some WordPress actions and filters. To make requests, a developer must be authorized against the API by one of these three ways. Here we choose the basic authentication with an API Token and a email address. Also we need to provide the URL of Zendesk CRM. All this data is custom, so we need to implement some options page, where the admin can fill these fields with his own values. The developer prepares the Settings form (see screenshot below) using GF plugin. Later this form can be exported as a JSON file and then imported anywhere the plugin will be installed. 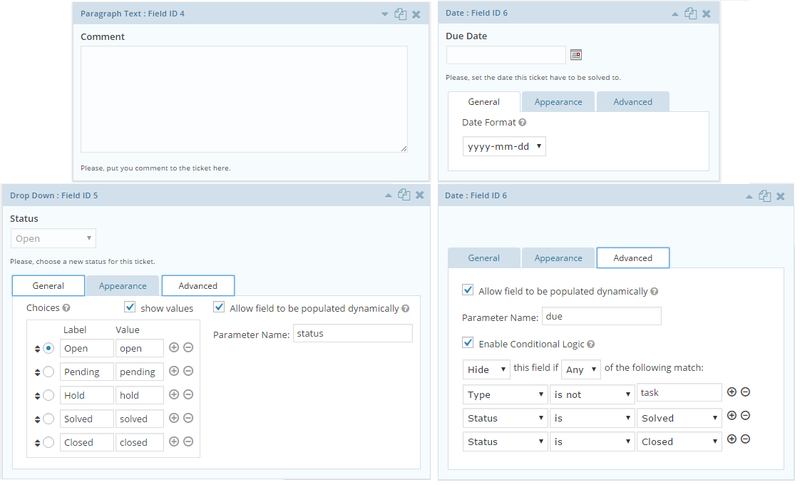 Notice, we define parameters for the pre-populated fields to make the form show the settings submitted at the previous time. It is necessary to register the settings which will be used at the options page. We’ll do this in two steps. 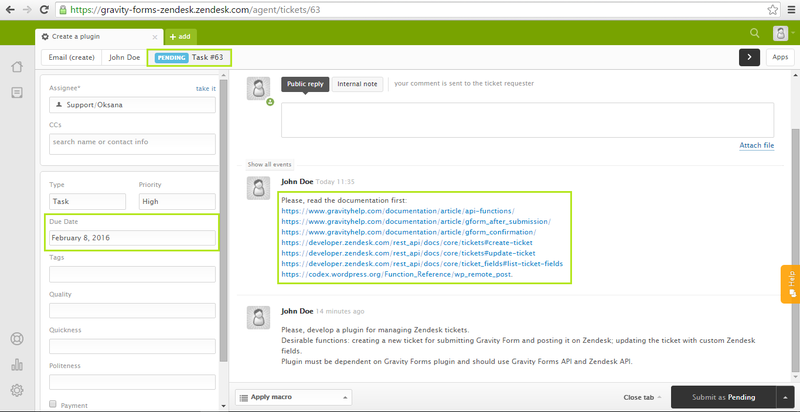 Step 1 is to add an action to the admin hooks function in the Gravity_Forms_Zendesk class. 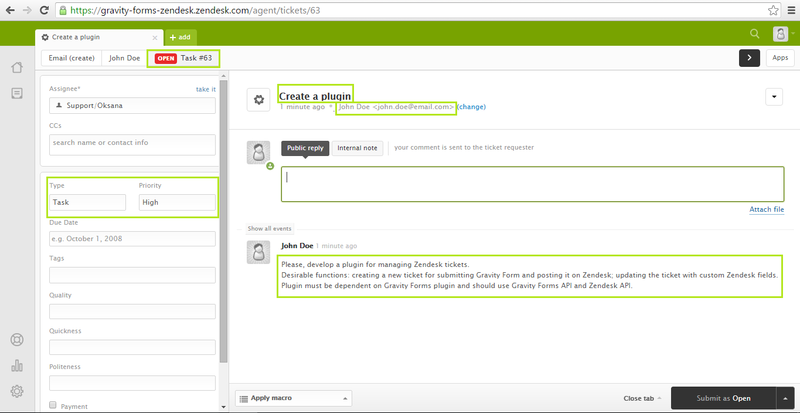 Step 2 is to implement the register_settings() method of the Gravity_Forms_Zendesk_Admin class. 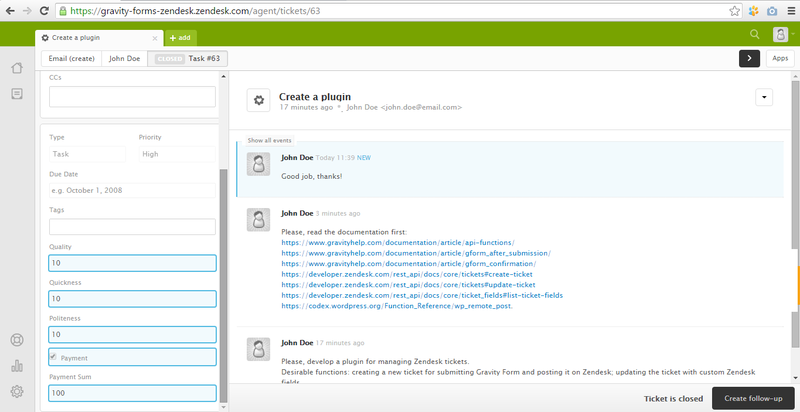 Here a programmer needs to add the admin_menu action to the admin hooks function in the Gravity_Forms_Zendesk class. 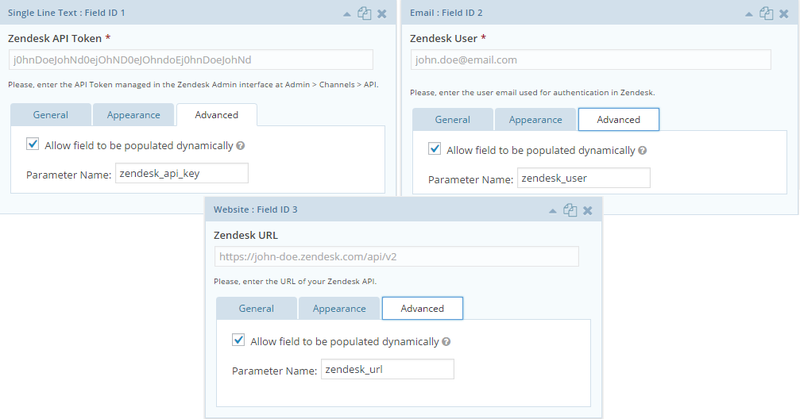 In this file gravity-forms-zendesk-admin-display.php the form Settings will be functionally embedded. Also there will be a message shown after successful submit of this form. To embed the form will be used a function call provided by GF plugin. Pay attention that keys in the $fields array are exactly the same as the parameters in the Settings form’s fields. The last step of developing Settings page is to update settings received after the form submit. This function will look like the following (written in the Gravity_Forms_Zendesk_Admin class). As you see, to get the value of the specific form field the GF function rgar() was used. Notice, the field ID must be a string. Before the developer will be able to make API requests, the admin must enter the settings. 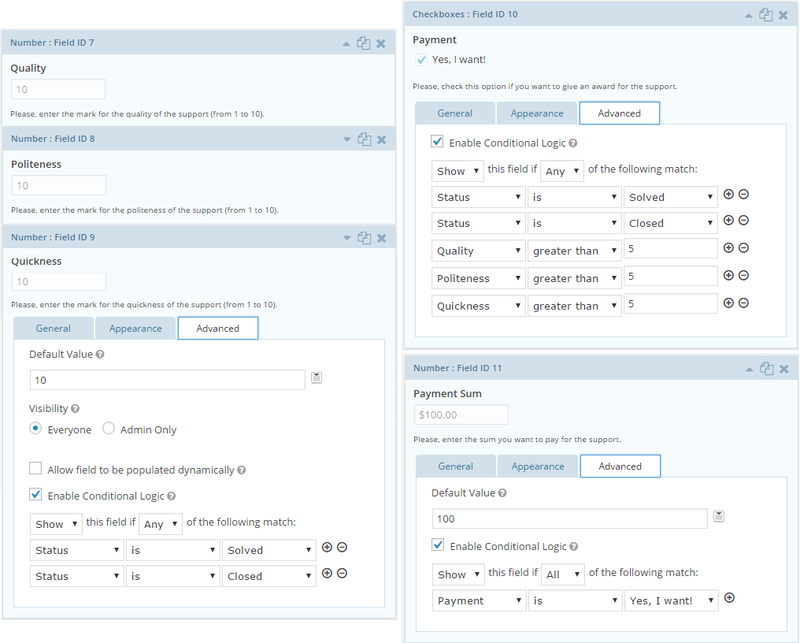 The first form for creating a ticket is pretty easy so its building doesn’t need any comments. To insert this form into the WordPress page, the admin can use such a shortcode provided by GF API. The function create_ticket() will be called after the triggering of gform_confirmation GF event. It has three main blocks: getting data from the form ‘Create a ticket’, posting this data to the Zendesk CRM, and proceeding the response from Zendesk API. We’ll get the data in the same way as for the previous form – using rgar() function. 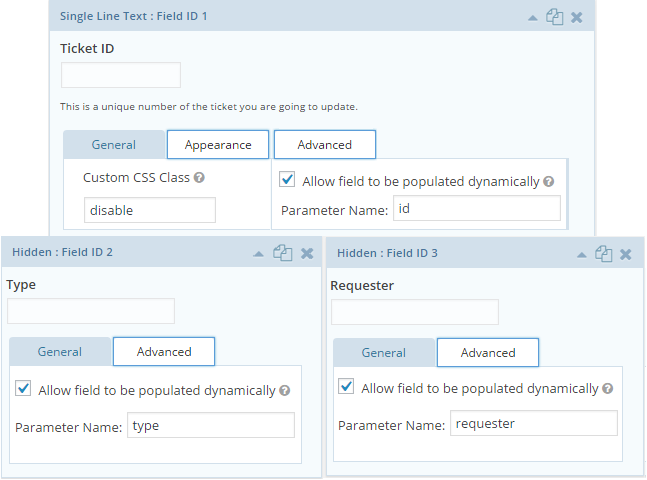 But this time there are some fields that have options or sub-fields, so they have complicated ID with two parts: for example, Name field has two sub-fields: First with ID ‘5.3’ and Last with ID ‘5.6’. Also we have to take care about deleting DB entries left by the GF plugin. The function delete_entry() will be similar to the previous one, but there is a difference in the input parameters: there will be three arguments for the gform_confirmation event instead of the only necessary argument for the gform_after_submission which was used for proceeding Settings form. To continue work with the submitted ticket, the plugin needs to know ticket ID, ticket type and ticket requester ID. This data will be received with Zendesk response. 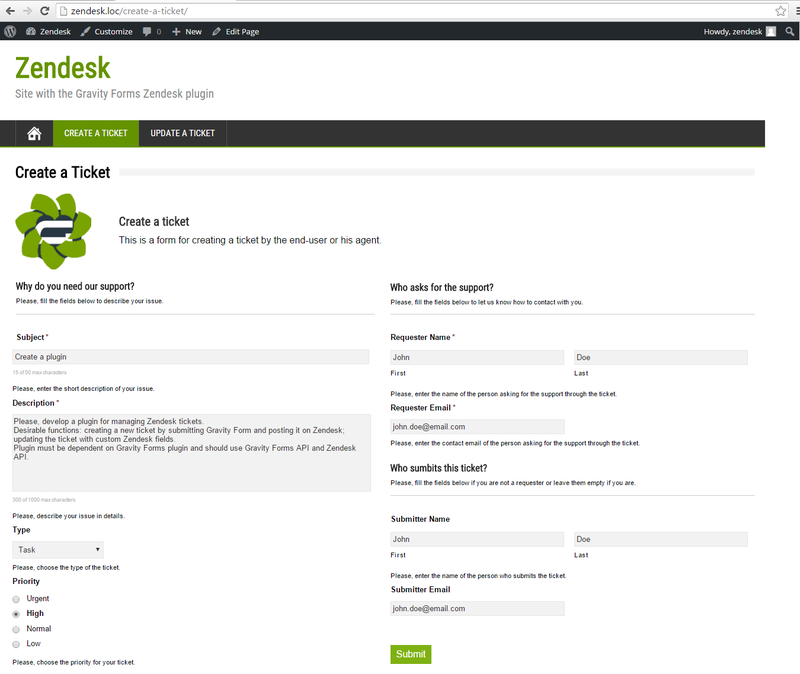 If ticket creating succeeds, Zendesk API returns response with 201 code and the body with all ticket properties. So before we get the necessary data, we must check its presence in the response. That will be done within the private methods body_exists() and ticket_exists(). Their code is given below. 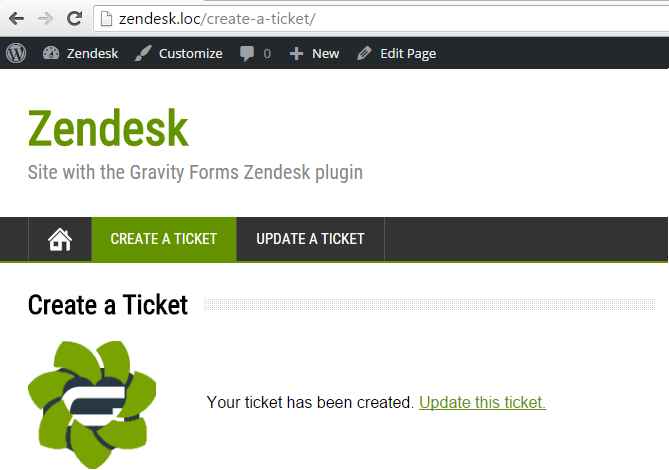 Now it is possible to write the whole function create_ticket() in the Gravity_Forms_Zendesk_Public class. At this step we’ll test how the function create_function() works. Assume that our user wants to give someone from the support team a high-priority task, and he submits it by himself (so he is both the requester and the submitter). After successful submit the user will see the confirmation message on the same page. To continue work with the created ticket, users must have a possibility to update it. For this purpose the developer build a new form “Update a ticket”. It will be more complicated than the previous one and have three sections. The first section will contain the fields for saving intermediate information between the steps of creating and updating a ticket. It means we need to make these fields pre-populated and put there $_GET parameters names: the values of these parameters will be received from the browser command line. Users don’t need to edit or view this data, so Ticket ID field will be read-only, and Type and Requester inputs – hidden at all. This section is always visible to users, and at least one of its fields has to be filled. Status field is also pre-populated and will show the option that was chosen at the previous update. Due date field has to be shown only if the ticket type is task and this task is not solved or closed yet. It may be useful to have some fields expressing user satisfaction with the support, and this section is created just for them. Sometimes it is not enough to have only predefined system fields in the ticket. And this is exactly that case, because we don’t have system Zendesk fields for the data that will be set in the Satisfaction section of our Update a ticket form. So the owner of the Zendesk CRM (let it be the admin of our WordPress site) can create such custom fields and use them along with the system ones. A separate custom field has some properties (see screenshot below) that should be filled by the admin. There are two main fields which are important for us: field’s title defined by the admin and field’s ID given by Zendesk. At the next step we’re going to get ID of the custom ticket fields by their titles, so it is important to name fields in the obvious way. 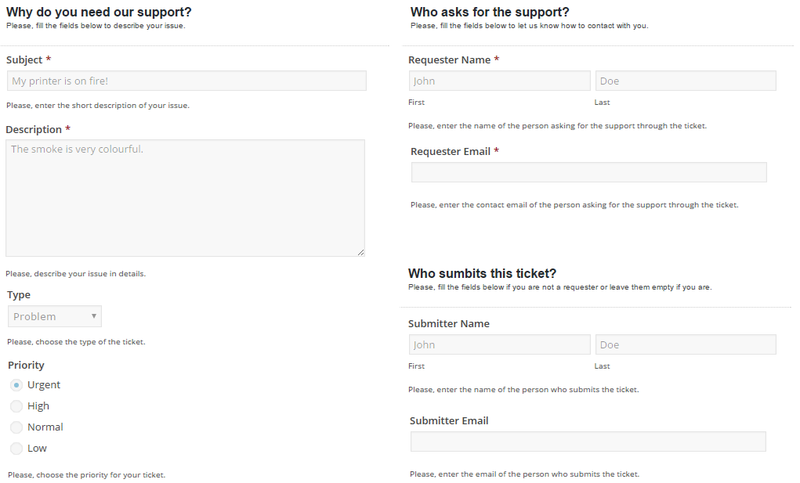 Perhaps the best one is to give the same names as for the Update a ticket form inputs. And now it is everything prepared for writing the function proceeding data from the Update a ticket form and posting them on the ticket. Firstly, the developer needs to fetch custom ticket fields using the private method get_ticket_fields() which was described above. Secondly, he should fill $custom_fields array by the ticket fields’ IDs and corresponding values received from the form inputs. Thirdly, this array will be put into the main array $ticket and sent with the other data by the function post_ticket(). At this step we’ll test how the update_function() function works. 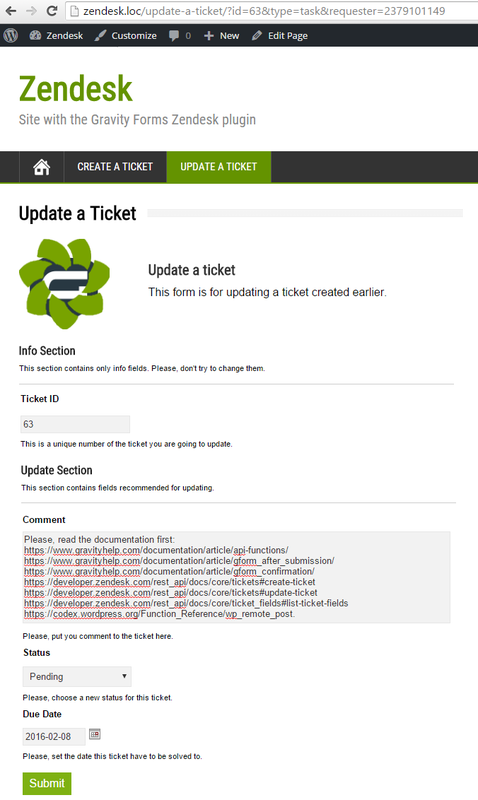 Let our user write a new comment, set a due date (as the ticket has type ‘task’) and change the status from open to pending. If everything is OK, the user will get the confirmation message with suggestion to update ticket again or to create a new one. 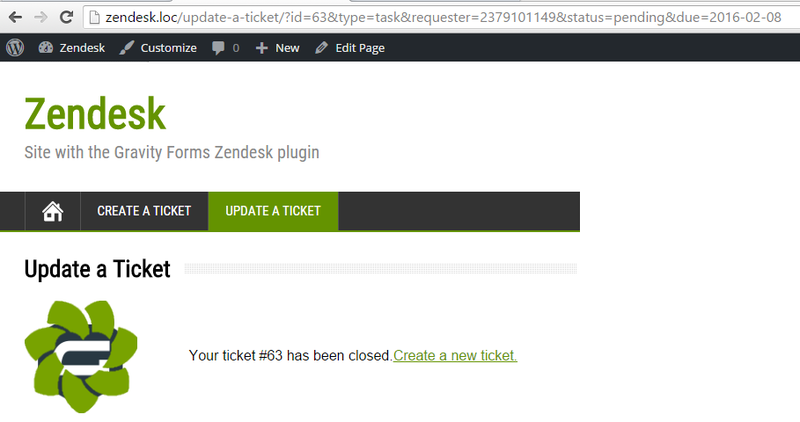 We’ll choose the first option at the step 13.4. but now let’s see ticket updates on Zendesk side. As we assumed the updated ticket had new parameters: new comment (from the user, not support agent! ), due date and new status. If the user closes the ticket the form will show him fields of the Satisfaction Section. 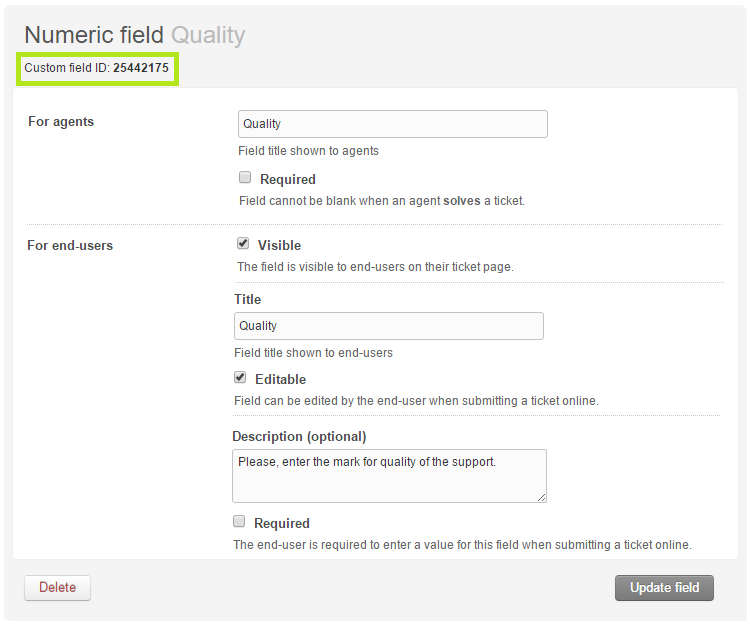 Remember these are custom Zendesk ticket fields, so we’ll pay more attention filling and checking them later. The closed ticket can not be updated. There is the only possibility to create the follow-up ticket. We don’t pursue the goal to implement this function, so it’s our last step. Finally the user’s ticket will have all fields filled. 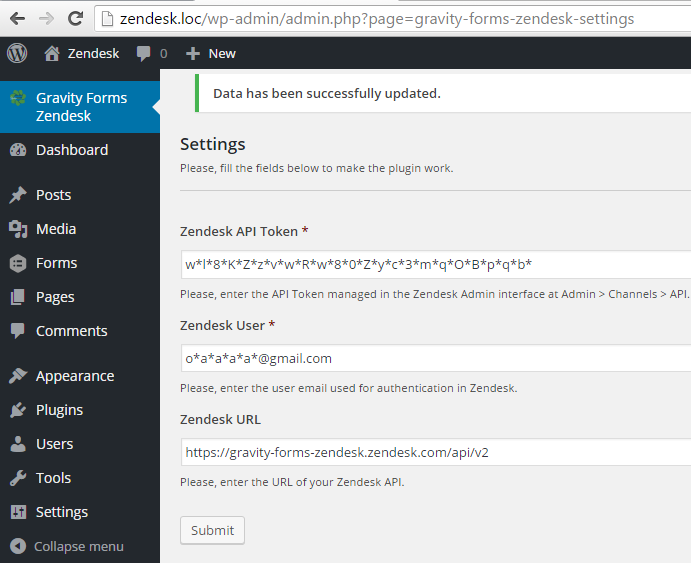 And now we can export created forms and install them with the Gravity Forms Zendesk plugin on any WordPress website to make its support faster and better.